Bulk calculator carabiners -carabiner calculators, personalized, at the lowest prices in the USA and Canada . Unique design for calculating on the go. Great for back packs, belt loops, briefcases, and straps. Battery included. We also supply blank (not imprinted) bulk calculator carabiners for $1.59 each. Free artwork design. Unit prices below include your 1-color custom imprint. 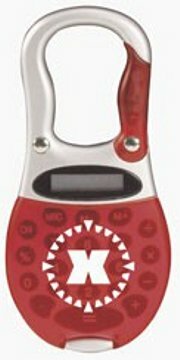 Add $0.20 per carabiner for each extra imprint color. Setup Charge: $50.00 per imprint color; Re-order Setup Charge: $20.00 per imprint color. Raised Rubber Keyboard with protective flip cover. Imprint Area: 1.25" H X 1.63" W.
PRODUCTION TIME: 5-7 working days after art approval.